In a world full of copycat tools, the Worx Switchdriver stands out as being truly unique and innovative. The Switchdriver is a cordless drill/driver that’s unlike any drill you’ve ever seen. It’s equipped with two rotating chucks, which allow you to quickly and effortlessly switch back and forth between drilling pilot holes and driving screws—without changing bits. The Switchdriver’s dual chucks accept any standard ¼-in.-shank bit, so they can be used to hold one drill bit and one screw-driving bit, two different sized drill bits, or two different screw-driving bits. To switch back and forth, simply depress the red button located directly above the trigger and rotate the chuck 180° in either direction, as shown above. You no longer have to fumble with loose bits or continuously tighten and loosen the chuck. Simply load a bit into each chuck and get to work. The Switchdriver is also the perfect tool when using a pocket-hole jig to create strong, tight-fitting wood joints. Install the pocket-hole step-drill bit into one chuck, and place the jig’s extra-long screw-driving bit into the other chuck, as shown below. Now you can drill and drive at the flick of a wrist. The Switchdriver comes complete with two 20-volt, 1.5-amp-hour lithium-ion batteries; a five-hour charger; two twist-drill bits (1/8 in. and 3/32 in.) and one No. 2 Phillips screwdriver bit. And it’s covered by a three-year warranty, and 30-day money-back guarantee. The Worx Switchdriver (Model WX176L, $120) is available at www.worx.com and other online retailers including Lowe’s. 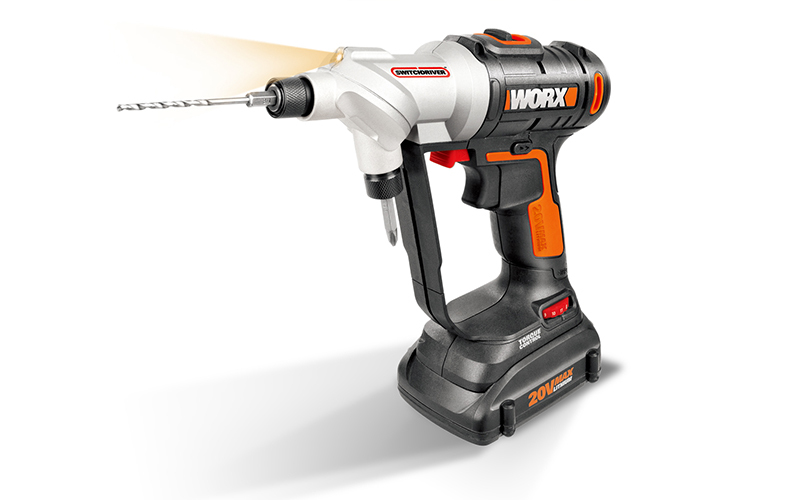 Check out worx.com for other power tools to add to your arsenal.